Pedicures are now one of my favorite things in life; Babystar always notices my ‘pretty toes’ and they are usually painted blue. My oldest daughter was seven when she had her first pedicure. She was at the beauty salon with me and my friends while we were getting ready for my wedding, and she got a mini-pedicure and clear polish. Because there is a giant age gap between my children, Babystar is along for the ride on a lot of big girl adventures. In the tradition of tagging along for special occasions, Babystar came with me and her big sister to get pedicures last Thursday. Big Sister had prom on Friday. She sat on my lap during our pedicures and played with the buttons on the massage remote, making some very interesting patterns on my back. The lovely lady that always does my pedicures gave Babystar a little leg lotion and Babystar was fascinated. Which is super weird, because my wiggly toddler usually cannot stand for me to put any type of lotion (or SUNSCREEN) on her little body. She was so excited and proud to be with us, so when she said ‘I blue toes too,’ I agreed. 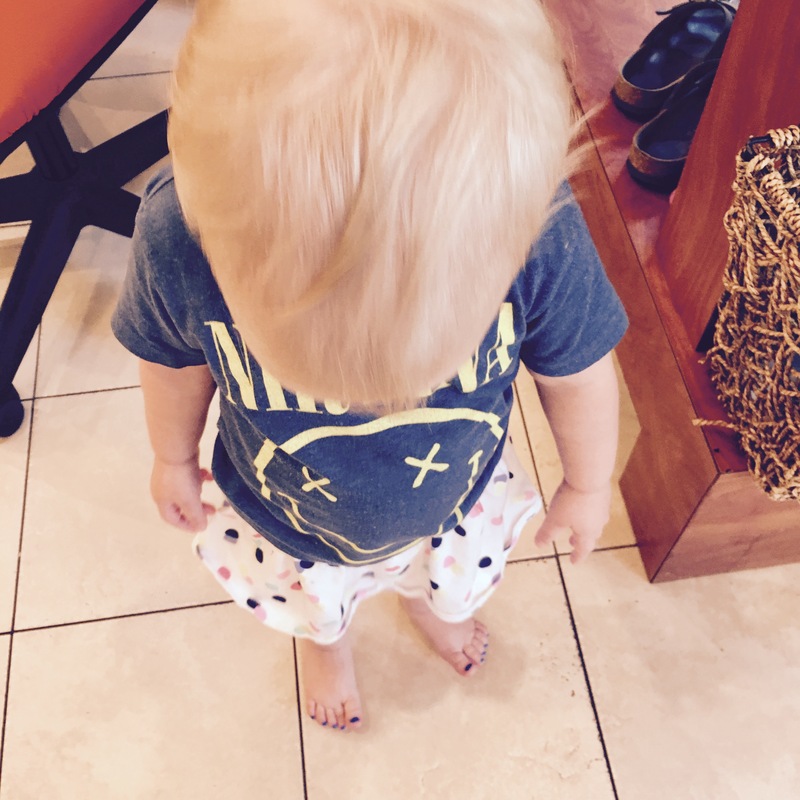 My sweet little still-one-year-old baby held so still while getting her toenails painted blue. And she is so very proud to show everyone her blue toes like mama. What do you think? Too young? Or ok since it was for a special occasion? Or totally fine and no special occasion needed? My little monster loves snakes and bugs and pretty dresses and stars and rocks and dinosaurs and ponies. But she mostly loves whatever Big Sister and Mama are doing. Next New Clothes. And Old New Clothes. Let her! She’s modeling after you and big sis! As long as it’s not harmful let her have a little fun playing as a big girl! Yes, I definitely think make-up was linked with ‘dating’ for me too, growing up. But now it’s just fun!